When Can Police Conduct A Warrantless Search? Justices Hear 2 Cases On Tuesday, justices heard two cases regarding an individual's reasonable expectation of privacy. One involved the locked trunk of a rental car; the other, a motorcycle parked in the driveway. 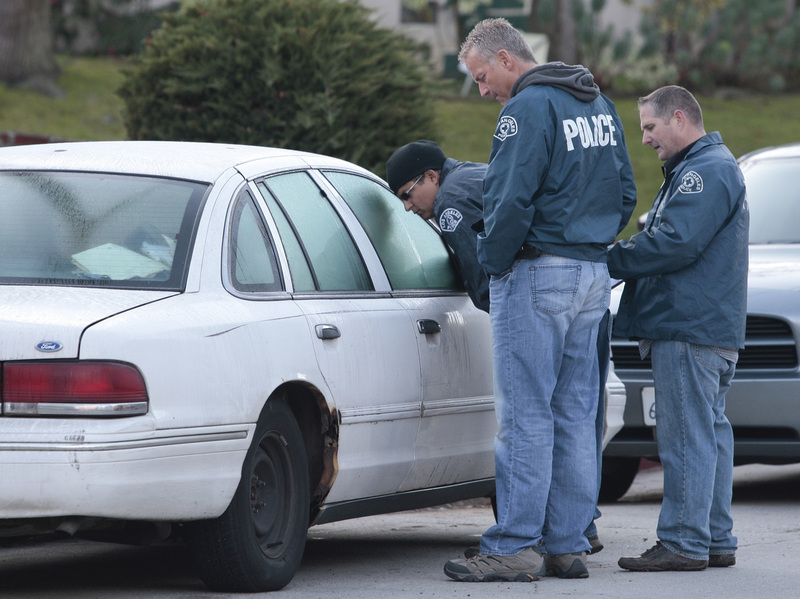 Los Angeles Police inspect a vehicle parked in the same neighborhood as a crime scene in 2012. The Supreme Court heard arguments on Tuesday regarding when police can search a vehicle without a warrant. Tuesday was car day at the U.S. Supreme Court, as the justices heard arguments in two cases testing when police can search a motor vehicle without a warrant. While both cases challenged criminal convictions, both involved searches in circumstances that could well be encountered every day by law-abiding citizens. In both cases the justices seemed divided on how to draw the lines, with Trump appointee Neil Gorsuch giving indications he might side with the court's liberals, and Justice Anthony Kennedy — who so often casts the decisive fifth vote in cases — taking a harder line. The first case involved a search of a rental car, in which the driver's name wasn't on the rental contract. In the age of Zipcar, it's hardly unusual for a car renter to let his friends or family members drive a car he has leased, without listing those names on the contract. In the case before the Supreme Court, Terrence Byrd's fiancée gave him permission to drive a car she rented but didn't list him as one of the drivers. When police stopped Byrd for a minor traffic violation outside Harrisburg, Pa., he gave officers the rental contract. When they ran his name, they found he had a criminal record. Without a warrant, they searched the locked trunk of the car, where they found Byrd's personal possessions and 49 bricks of heroin. Byrd challenged the legality of the search in court, and a federal appeals court ruled that because his name was not listed on the contract as an authorized driver, he had no legal right to challenge the search, and no expectation of privacy. "What's our rule going to be?" asked Justice Stephen Breyer, adding that search cases are "too complicated already." Breyer said police need to know what the rules are. But as the argument unfolded, the various hypotheticals illustrated the reasons for those complications. Breyer, for instance, posed a scenario where "Bill and three friends" are sitting around and Bill asks his dad if he can borrow the family car. Yes, says Dad, but only Bill can drive it, nobody else. In the end, Jim, one of the friends, ends up driving the car, with Bill's permission, and is stopped by police for a traffic violation. Is Jim entitled to a reasonable expectation of privacy if police want to search the car, or is he up the creek just the way Terrence Byrd was, because, for insurance liability purposes, he is not an authorized driver? Jim is entitled to an expectation of privacy, contended Byrd's lawyer, Robert Loeb. The government took the opposite position. Justice Sonia Sotomayor asked why a driver doesn't have an interest in his possessions that are in a locked trunk, regardless of whether he is an authorized driver under a rental contract. To allow searches just because a driver isn't listed on the contract would be to authorize searches of "every rental car, without probable cause, that might be on the road," she said. Breyer suggested this rule: When you are in control of a car, you have a legitimate expectation of privacy, unless you are committing a crime. That, he noted, would be a clear rule. Chief Justice John Roberts proposed a different rule, more friendly to police. Look at the rental agreement if it's in the car, and if the driver is an authorized driver, "that's it." No search. If there is no rental agreement, Roberts added, "it raises doubts that might otherwise not be there." The Justice Department's Eric Feigin argued that the place to draw the line is where it was drawn in this case by the lower court: Terrence Byrd was an unauthorized driver so "he doesn't have any connection to the car at all." He has no right to challenge anything and no expectation of privacy. Hold on, interjected the chief justice: It matters that the person who rented the car gave him permission to drive it. The chief drew laughter in the courtroom when he wryly observed that "this is probably not the only time" that a person who signed a car rental agreement gave someone not specified on the contract permission to drive the car. Justice Ruth Bader Ginsburg noted that nearly a century ago, the Supreme Court ruled that police could search a car without a warrant if they had probable cause to believe there was evidence of a crime inside the car. Police didn't have to obtain a warrant back then, she observed, because cars on the roadside are mobile — and highly regulated. But, she said, here the police are using the car exception, and the probable cause requirement "has vanished." How far does the sanctity of the home extend? That century-old case Ginsburg referred to was front and center in the second case of the day. At issue was how far the mobility argument can go in eliminating the warrant requirement in the driveway of a private home. The area immediately around a house is called the curtilage, and the Supreme Court has ruled that police cannot search that area without a warrant — that it is, in essence, part of the house. The question in Tuesday's case was whether that warrant requirement applies to motor vehicles within the curtilage, or whether the court's 1925 decision allowing warrantless searches of motor vehicles with probable cause includes vehicles in the curtilage. In Tuesday's case the vehicle was a motorcycle that twice had been used to elude police at high speeds following traffic violations. Police eventually traced the man they suspected was the motorcyclist to the home of his girlfriend. There they saw a motorcycle under a tarp, parked in the driveway, 5 feet from the back entrance to the house. One of the officers walked up the driveway, lifted the tarp, and saw a motorcycle with all the same markings as the one he had been looking for. When he checked the vehicle identification number, it showed that the vehicle had been stolen in New York years earlier. The man who had the motorcycle, Ryan Austin Collins, eventually was prosecuted for possession of stolen property; he challenged the search in court. Justice Samuel Alito started the questioning Tuesday, asking how this situation is different from a car parked on the street — which could clearly be searched without a warrant if police had probable cause to believe there was evidence of a crime. Lawyer Matthew Fitzgerald, representing Collins, argued that the mobility of a vehicle cannot be the differentiating factor in a case like this. There are all sorts of things that are even more readily mobile than cars, he said — a pile of cocaine, for instance, which can be flushed down a sink in seconds. The key in a search of a home or its curtilage, he contended, is to have a warrant. Questioned by Justice Stephen Breyer, Fitzgerald said there was no emergency in this case. Nobody was home when police went to the house. He later pointed out that while warrants took a long time to get in 1925, today they can be obtained and executed in less than an hour. Justice Ginsburg, noting that in this case the house was occupied by the defendant's girlfriend, asked, puckishly, suppose this were a new girlfriend, and the defendant had not yet stayed overnight but "was hopeful?" That's not the case here, replied Fitzgerald. She was the mother of his child and he stayed at the house several days a week. Pressed by Justice Alito, Fitzgerald conceded that police had probable cause to believe this was the motorcycle they were looking for. But he said they needed a warrant because it was in the curtilage. Didn't police have an interest in seizing "this dangerous item" as soon as possible, asked Justice Kennedy. After all, it was "used for a dangerous purpose" and was "the instrumentality" of a crime. Fitzgerald stuck to his guns, noting again that drugs were far more mobile than vehicles. Kennedy, his tone annoyed, continued: "So you think that ... the ease of moving [the vehicle] is irrelevant to this case?" "Yes," replied Fitzgerald. Arguing on behalf of the prosecution, Virginia acting Solicitor General Trevor Cox said the mobility of the vehicle meant that the usual protections afforded to the curtilage do not apply. Justice Sotomayor shot back that if that were the case, it wouldn't matter where a vehicle is, even it were in the living room — after all, she noted, some people keep their bikes inside. When Justice Elena Kagan noted that in past cases the court had ruled that the curtilage is part of the home, Cox contended that the curtilage doesn't have be treated the same way in all cases. At that Justice Gorsuch pounced. So under your rule, he said, police can search a garage or a barn without a warrant? Only if it's not part of the dwelling, replied Cox. Pressed by Chief Justice Roberts, Cox agreed that the mobility exception to the warrant requirement is based on the notion that at any time, the motorcycle's owner could come back, rev up the engine, and leave the scene. Gorsuch all but threw up his hands at that. In that case, he said, why don't we knock out the warrant requirement for the home too? Do the same thing for drugs and personal papers. "They have a fireplace ... they could destroy the papers," he said. "They have indoor plumbing," so they could flush the drugs. It was a tough session for Cox — tougher than the justices knew. As soon as he got outside the courtroom he was on the phone to the delivery room back home, where his wife was about to give birth to his first child.